A group of 34 Occupational Therapy Doctoral students from Belmont University met at Permobil, leader in the rehabilitation power wheelchair industry, to collaborate with representatives and students and faculty members from Vanderbilt’s School of Engineering to adapt ride–on cars for children with mobility impairment and their families. 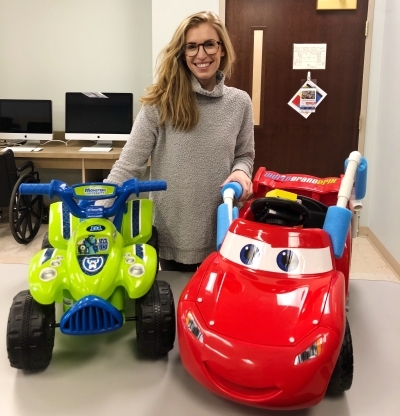 The event, hosted by Associate Professor of OT Dr. Teresa Plummer through the organization Go Baby Go, showcased the importance of self-initiated mobility in early development and the need for greater mobility options for children living for disabilities. Volunteers were divided into teams, each team serving the unique needs of one pediatric client. Ride–on cars were rewired to eliminate the use of the foot pedal and were outfitted with a big red “GO” button in the center of the steering wheel. The plastic seats were redesigned and furnished with necessary head and lateral supports using foam, PVC pipe and other materials. Each client left with a one-of-a-kind car and a big smile. For a video from the event, click here.